Thank you, Lawton First United Methodist Church, for your Scouting ministry! Former Board President John Fenoglio poses with Shannon M., a proud Four Star recipient. Shannon earned her P.R.A.Y. awards while a Girl Scout and is now a member of Crew 100 in Mt. Diablo Silverado Council. P.R.A.Y. Board members work hard to support the P.R.A.Y. ministry. How exciting to meet a P.R.A.Y. award recipient in person. Congratulations, Shannon on your accomplishments! Click here to meet the P.R.A.Y. Board Directors. Click here for information on the Four Star Award. St Marks United Methodist Church in Midlothian, Virginia has begun to reap rewards from the PRAY program. The Pack chartered to the church, Pack 1879, has offered God & Me and God & Family programs for several years now. Each year the pack had between 8 and 10 Scouts participating in the two programs. Twenty three youth completed the programs this year! Ten Scouts from the pack participated (some taking God & Family after completing God & Me last year). There were two scouts from another pack who are members of the church. 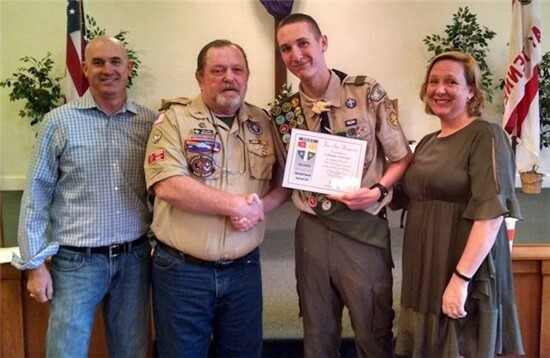 Eleven youth from the church, not in scouting programs completed the programs as well. This year the classes were offered at 9:45AM when the church holds its contemporary service. Some parents stayed in the classrooms and some attended the service. Many of the families whose sons participated in the program do not regularly attend any church. This year, with additional completion time required the presentations were planned to be made at the contemporary service which happens to be the one service with the highest attendance of younger families and often higher attendance than the blended service. This allowed more members of the church to be exposed to the PRAY programs, to the pack, as well as offering church to those who do not generally attend. A great success by any measure! Also pictured are Reverend Fran Cooper and Religious Emblems Coordinator Laura Russell. * Some students not present. Also pictured are Cubmaster (and church member) Ron Flournoy, Laura Russell, Religious Emblems Coordinator (and member of church) and Pastor Fran Cooper.